The Google Blog announced that they will be adding personalized search results by default for any person signed in to their Google Account. That means if you use any one of the following Google services Gmail, Orkut, AdWords, AdSense, Groups, Alerts, and so on... you will automatically be shown search results tailored to your past searching history. As Danny explains in great detail you can turn them off by signing out or even pause them, but Google will still hold on to this data for unspecified amount of time. There are two clear concerns here. The most obvious is the privacy concern, but that is for a different blog. 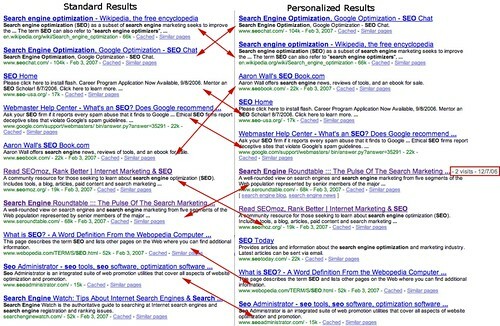 The second concern is the search engine optimization area. How can one optimize a site for a search results environment that is constantly changing, not just based on an algorithm that Google updates often, but based on personalized preferences and behavior? Yes, Google is tracking your search history, just login and click here to see what they have tracked. Let's compare the search term "seo", when I am logged in and not logged in. You can clearly see (click on the image to get a full size version) how all the results are sorted differently. The Wikipedia result is number one in the standard results, but maybe Google knows that SEO Chat is more relevant to me? I actually never visit SEO Chat, so maybe Google got that one wrong? But you can see that since I visit this site, the Search Engine Roundtable, more often than SEOMoz.org (a very good SEO blog), that it ranks this site higher than SEOMoz.org for that search in my personalized results. Imagine a slightly different ranking per user. Imagine having to explain this to a client. Why don't I rank #2 for my keyword, yesterday I did. Hey, my wife searched on my keyword phrase and I was #3 and not #2, why? Well, maybe your wife is cheating on you? :-) Get the point? Folks in the forums have mixed feelings on it. In any event, it appears from this move, Google is serious about personalized results. More and more people are signed into Google services, without knowing it. My question is what percentage of Google search users are actually signed in during a search? I suspect it isn't more than 10%, but I can be wrong. I would love to hear the percentage.